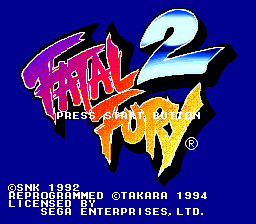 Fatal Fury 2, known as Garou Densetsu 2: Aratanaru Tatakai (餓狼伝説２ 新たなる闘い) in Japan, is the sequel to Fatal Fury. Originally released by SNK for the Neo Geo MVS/AES in 1992, it was brought to the Sega Mega Drive by Takara in 1994. Note: The commands below can be changed through the options menu and, for that reason, and are used in the list of "Special Moves". Main article: Fatal Fury 2/Magazine articles. NEC Retro has more information related to Garou Densetsu 2: Aratanaru Tatakai.